Save SAR 40 (20.10%) – Earn 15 Shukrans What is Shukran? Shukran is the Landmark Group’s award-winning loyalty programme in the Middle East, which allows you to earn Shukrans when you shop any of our brands. 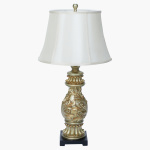 Unique in its charm, this table lamp will definitely highlight your bedroom or living room with ease. Sporting a beautiful pattern of motifs on the stand, the textured metallic detail highlights the elegant shade.